I really love history, not just historical romance, but I love historical fiction and even history books. and no period of time has ever interested me more than ancient Egypt. Sure I should have been born into Victorian England, but man, sometimes I can't stop thinking about what it would have been like to live back in the time of the pharaohs. The crash of Pharaoh's colossal statue into a throng of worshippers brings the festival of the good god Ptah of Memphis to a sudden, bloody end. Prince Khay, the High Priest, barely escaped being killed, himself. He finds clues in the wreckage that show that the collapse was deliberately set. Now he is confronted with questions that grow more alarming with every answer he finds as the great temple of Ptah is rocked by a chilling series of murders. 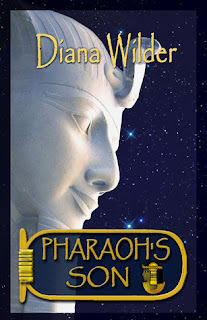 Increasingly entangled in clues that lead to even more mysteries, convinced that the gods themselves are taking a hand in the disaster, he appeals to Pharaoh for help and is sent a powerful ally in his older brother Hori, Egypt's Crown Prince, whose courage and resourcefulness are surpassed only by his bluntness. The brothers fight against time as they try to unravel the mystery, knowing that there is more at stake than treasure, and the forfeit is greater than a man's life. Something great and terrible is stirring, something they must find, hidden deep within the temple, something they must bring into the light before those who walk in darkness take it and turn it to evil. PHARAOH'S SON is a historical novel set during the golden years of Ramesses the Great. It is a tale of murder, intrigue and hidden treasure that reaches back into Egypt's heresy-shrouded past. This book was hard for me to get into at first. Maybe I was having a hard time concentrating, but I don't know, it just took me a while to get there. But when I did I really liked it. One of the confusing things for me in the beginning was the names. So many of the names sound the same, but as I got further into the book it became easier to tell the characters apart. You know in history class you always hear that Ramses II had tons and tons of kids, but it really hit me in this book. When Hori is in the palace talking to his sibling, Oh my goodness, he has so so many! That pharaoh was busy. I'm not entirely sure why but I liked Hori from the start, something about his attitude I really enjoyed, and I think I remember reading somewhere that he died before his father did so he wasn't the son that eventually got to be pharaoh, and I know that this is probably not what he was like in real life, but if he was like this character in real life that makes me really sad, because he would be an amazing ruler, especially if he has his brother Khay by his side. I also likes how she showed the pharaoh. She showed him as a person, sure he has some moments where he was truly "other" because he was in fact perceived as a living god, but at the same time she showed him as an extremely loving father who wanted to keep his children close to him. I liked that image of him because we often see portrayals of royalty and cold and uncaring especially towards family members, like that they just need an heir and a spare, you know? Now the mystery was hard for me to grasp at first, and when they eventually found the "treasure" I was a bit confused. That was what all the fuss was about? That was the reason Rahotep was willing to kill his brothers? I didn't get it, but I also don't have any deep ambition like he did, nor do I think that I can truly relate to the Egyptian mysticism. I think it is beyond fascinating and I also think that if I could choose a religion it would be one of the top contenders. This was a pretty serious book, but I did like the highlights of humor that the author threw in. Like when Hori starts giving away all of his jewelry to the poor (which I thought was so charming and sweet) and his man servant starts freaking out about it. So cute. I also thought it was funny how the Pharaoh was arrested because of Hori's orders. So while this book was originally hard for me to get into, I did eventually start loving it, and would definitely recommend it. I also would recommend reading the Afterward. Now I am sure all you good readers always read the forwards and afterwards, but I am ashamed to admit that I do not. But (!) I did for this book and it is truly interesting, because Diana Wilder gives us historical background on all the characters in the book.